Lighting: This will work for you especially if you are a minimalist. 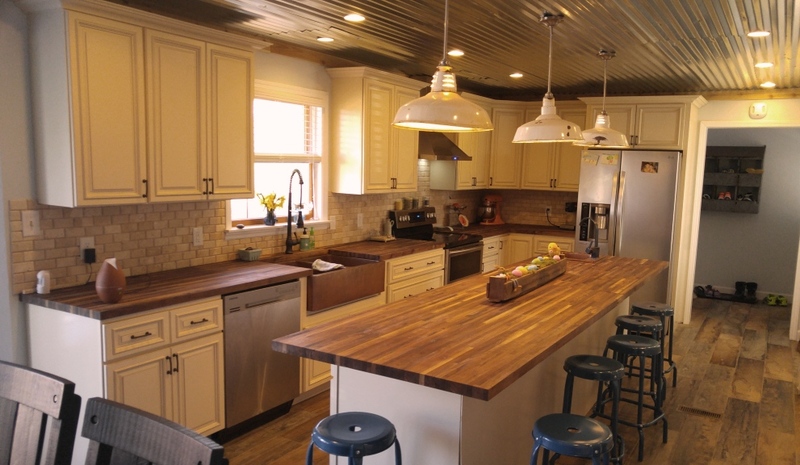 Under cabinet lighting illuminates the area for food prep, particularly during evenings. The most appropriate lighting to use is the LED strip light, keep in mind to always consult with your electrician for the most suitable lighting application. Power: Likewise, you should try to make your outlet inconspicuous; it does not make sense spending all your money installing the perfect backsplash tile with unattractive power cords creeping out. An under cabinet power outlet strips is definitely the way to go. Tablet mount: An under cabinet tablet mount works out for anyone who might want to watch a cooking video, check your emails, or have a personal Skype call. Knife block: This adds a little oomph to your cabinet, whoever came up with the knife block is a genius! It is slim and convenient; through the touch of a finger you can just swing the knife in and out. Jar opening: Jar openings are easy to install and it works best with people who have arthritis or if you need assistance with opening tough lids. Stemware rack: Under the cabinet is exactly what you need for a stemware design, it is functional and store a large number of glasses in a small amount of space. You might have used to make your kitchen more attractive and beautiful which you might want to share, feel free to contact us at Premium Cabinets of St. Louis. I like the recommendation to get things like under cabinet lighting and a bottle holder. It makes sense that having things generally only found in t luxury kitchens installed in mind would be a good way to improve the overall feel. It’s something I’ll have to remember when I get new cabinets and counters to ensure they look good and stay functional for what I need. Thanks for sharing such a nice post, Kitchen cabinet is the most desirable activities by any home-owner. The information you have shared is very informative. beautiful I really like this one! So modern and good looking! and I am really impressed by reading this blog! I’m just curious. Did you coat the insides and outsides with polyurethane? That must have been a ton of work! Start to finish how long did this kitchen take? We’re embarking on a kitchen remodel too, and I’m overwhelmed trying to pick out everything! Thanks for these tips on cabinets. I love a few of these examples and I will definitely incorporate them! Thanks for these creative ideas. I hope everyone who are looking for some spice up ideas for their kitchen renovation should read this post. There is absolutely no need to spend a lot on the kitchen cabinets. Even if you have old cabinets, new look can be given to them. Apart from that, I don’t think it’s necessary to spend on the decorative lighting. A clean white light on the top and well-ventilated windows or skylights are enough to give your kitchen a new charm. I loved when you mentioned how you can use LED lights under your cabinets to add more light. It is good to know that you can customize your cabinets as much as you want and make your kitchen look better and have more appeal. Personally, I would want to make sure my cabinets can offer as much storage as possible while helping me add more beauty to my kitchen space. The cabinets that you have in your home are a big part of the overall style you put on display. Because the house is your home, it only makes sense that you want it to look as good as possible.